ClotCare congratulates editorial board member William E. Dager, Pharm.D. on his recent selection for the ACCP Clinical Practice Award. This award and some of Dr. Dager's achievements are described below is an excerpt taken from the ACCP website at http://www.accp.com/docs/report/rpt0908.pdf. 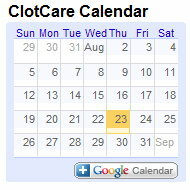 You may also click here to review Dr. Dager's bio-sketch on ClotCare. The ACCP Clinical Practice Award is given to a College member who has made substantial and outstanding contributions to clinical pharmacy practice. The criteria considered in identifying potential candidates include exceptional leadership in the development of innovative clinical pharmacy services and sustained excellence in providing these services. William Dager is a pharmacist specialist at the University of California, Davis Medical Center (UCDMC). He also holds an appointment as Clinical Professor of Pharmacy at the University of California, San Francisco (UCSF). Dr. Dager’s outstanding accomplishments include more than 20 years of practice leadership in clinical pharmacy, including work that has been instrumental in justifying and developing clinical pharmacist service roles in critical care, clinical pharmacology consult services, and inpatient anticoagulation management. In particular, his contributions in the areas of cardiology and anticoagulation have assisted many ACCP members in the clinical management of their patients. In recommending Dr. Dager, one of his nominators wrote about his frequent contributions to ACCP’s Adult Medicine and Cardiology Practice and Research Networks (PRNs). "He has provided the networks with insightful answers that reflect his research and clinical expertise. This has enabled me to educate our staff in a more efficient and timely fashion. He is quick to offer valuable perspective and guidance on the therapeutic dilemmas and challenges posted on the listserves." Dr. Dager has received numerous awards, including the UCSF/UCDMC Outstanding Preceptor of the Year, Fellow of the California Society of Health System Pharmacists, the UCDMC Outstanding Achievement Award, and the UCSF Long Prise for Excellence in Teaching. His publication record includes numerous research articles, reviews, practice guidelines, and book chapters that focus on clinical pharmacy and pharmacotherapy.